Bet Bryce Love to win Heisman Trophy at +800 on Karamba. Bet Trace McSorley to win Heisman Trophy at +2000 on 888sport. Bet Rodney Anderson to win Heisman Trophy at +2800 on 888sport. Bet Jake Browning to win Heisman Trophy at +3300 with Betway. College football season is right around the corner and that’s huge news for NCAA football betting fans. It’s no secret that football is one of America’s most popular sports and this season carries special significance. For the first time ever in a growing list of states, fans will be allowed to wager on college football games and individual awards adding a whole new dimension to the way the games are consumed and presented. Some of the biggest action will no doubt be on what is consistently the most publicized individual awards race: The Heisman Trophy. With the season still a few weeks away, the odds from top sportsbooks are tempting, so we’ll be breaking down five of our favorite candidates to keep an eye on here. Before discussing Browning it’s important to point out that the Heisman obviously isn’t a career achievement award. That being said, if Browning has the best year of his career, he should be a shoo-in. Browning was the PAC 12 Offensive Player of the Year in 2016 when he threw for 3,430 yards, 43 touchdowns and just nine interceptions. He led the Huskies to the College Football Playoff and after losing 24-7 to Alabama returned for his junior year to throw for 2,719 yards, 19 touchdowns and five interceptions. His odds are awfully attractive given what he’s shown he can do. Really the only reason his junior season was disappointing was because his sophomore season was otherworldly. Betway is currently giving Browning +3300 odds to snag a Heisman in his senior year and that value is honestly almost too good to pass up. Love and Taylor are crowding the top the best running back debate, but Anderson could very well end up having a better season than both. That’s due to his added dimension as a pass catcher which makes him a constant big-play threat in an offense-dominated conference. Anderson ran for the name number of touchdowns as Taylor (13) though racked up considerably less yardage (1,161). But he also hauled in 17 receptions for 281 yards and five touchdowns to round out his sophomore (yes, sophomore) year. 888sport offers fantastic +2800 odds on Anderson scoring a Heisman which is a great value to take advantage of if you have faith in the electric junior. Browning’s “disappointing” season ended in last year’s Fiesta Bowl in a 35-28 duel with another intriguing senior quarterback. 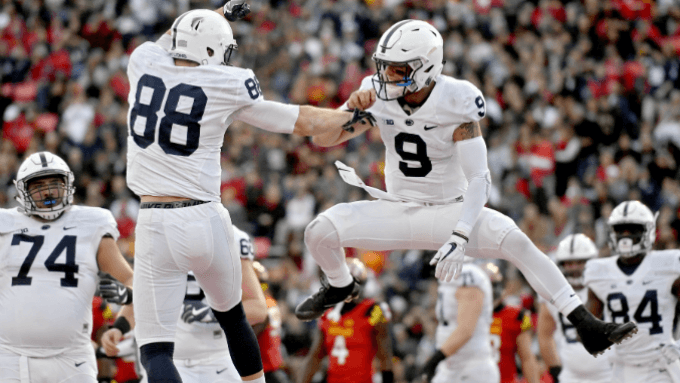 Penn State’s McSorley could be saving his best season for last and that would make him a serious contender for the award should he finally lead the Nittany Lions to the Playoff. Over the course of his sophomore and junior seasons, McSorley has racked up 7,184 yards and 57 touchdowns and just 18 interceptions. With that level of production leading into his senior year, it's a wonder he's listed with +2000 odds on 888sport to win the Heisman. While sportsbooks seem to be undecided, Love should clearly be considered the favourite to win the Heisman. By last year’s stats alone and given the fact he plays in the PAC 12, Love’s production should peak this year making him a frontrunner week 1. Love rushed for 2,118 yards placing him below only SDSU’s Rashaad Penny. He was the only Power 5 running back to break the 2,000-yard plateau on the ground where he also scored an astonishing 19 touchdowns. After putting up those numbers it’s a wonder a good number of bookies have his main competition, Wisconsin’s Jonathan Taylor, favored in an admittedly close race. Take advantage of Karamba offering him at +800 odds if you want a safe value pick that’s our favorite available overall.